Ewingsdale Hall is a heritage listed hall just outside of Byron Bay. It is located next to a picturesque church set in a beautiful rural setting with plenty of parking and no nearby homes. William Flick Lane passing in front of the hall is now a very quiet road without through-traffic. It is bordered by a row of established fig trees and surrounded by open fields. The Hall is managed by the Ewingsdale Community Association and I am their representative, we use all proceeds raised through weddings to maintain the Hall. I live locally and aim to give the wedding party plenty of space to create their own event. I am Laurie, The Wandering Celebrant. 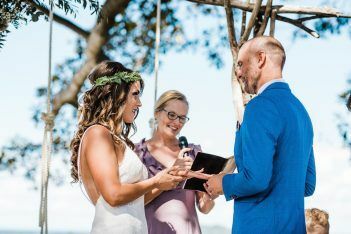 The Wedding Wanderer was inspired by my love for creative writing, the magic of a wedding and how that one person wanders into our lives and becomes our kindred spirit.